The design of space travel technology, even the limited space travel we do today, is huge and complicated. 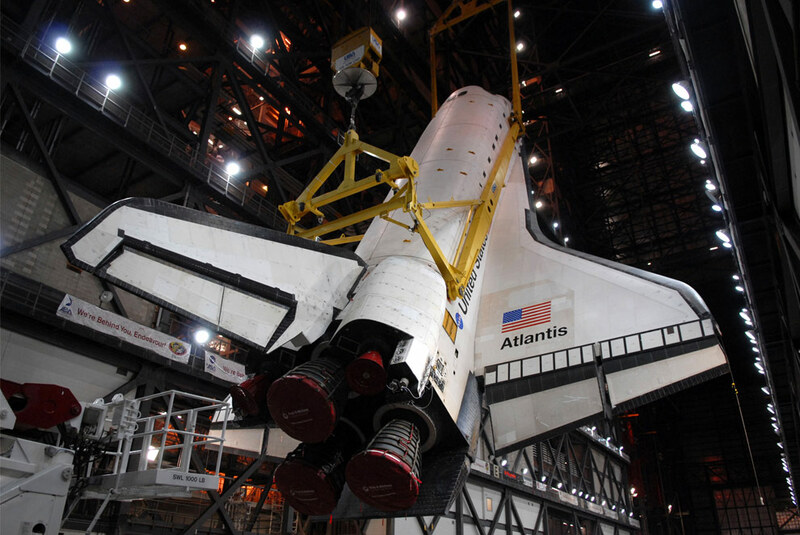 Here, a rarely photographed but critical part of any shuttle flight, inside the Vehicle Assembly Building (VAB), where the shuttle body is attached to the fuel tanks and boosters. Photo via Boston.com’s awesome “Big Picture” feature. The VAB was built for the Apollo program, and never reconfigured for the shuttle, hence the lift over the structure, up, over and down to mate with the tank and boosters). The certification for the persons operating the crane is awesome; I was lucky enough to be working in the VAB while they were certifying a fellow. 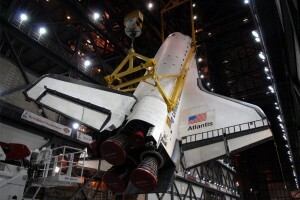 In the early days they put a spray can on an upside down wastebasket sitting on VAB floor and the fellow operating the crane is up 467 ft., working blindly. A fellow on the floor with a Walkie Talkie guides him, the last foot or so just going down in increments of 1/16th of an inch. The operator has to lay the crane on top of the spray can and empty the contents. One day they decided that the can might explode, so they went to an upside down styrofoam cup, the operator can’t crease it. The crane, by the way, weighs 50,000 lbs. 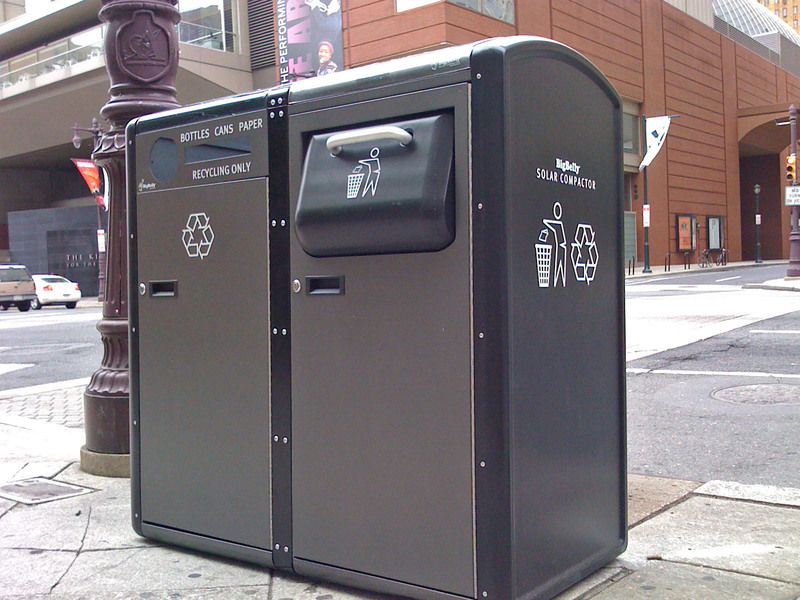 Just spotted a whole bunch of the new BigBelly trash cans — actually solar powered trash compactors, lining Broad from City Hall to South Street. These will eventually replace all of Center City’s 900 wire trash cans, which are truly a mess. The ones on Broad are paried up with recycling containers, the city’s first. Good step forward. Visually, the dark brown of these compactors is a good look, much better than the busy green patterns that the initial test cans sported. Perhaps the cans will be different colors for different neighborhoods. As far as usability goes, I don’t like touching trash cans, so that is the drawback. You have to pull open the top drawer to throw away something. But that’s a necessary part of the design, allowing the compactor to work. Officials also hope this will stop the common habit of “tossing” trash towards the basket… and the common habit of missing. Perhaps we’ll have less of a Philthadelphia? In the city of Philadelphia, there should be an above ground trolley for tourists. Call it the “Liberty Express” . It runs from Penns Landing to the Art Museum, down Market Street and then down Ben Franklin Parkway, with a total of 5 stops. Powered via the tracks. Not a whole lot of work to install tracks on the surface of that route, especially the Parkway. Smart cities generate revenue and buzz using their trolley lines as tourist attractions. Otherwise these days a trolley is really not an efficient mode of public transportation. Oh, and it should be mostly funded by the Casino. The 8th St – Convention Center stop will be inside the casino, or at least in a port-o-cul type entrance tunnel. It could also go to Camden. Yes, it’s NJ, but it’s also extra tourist revenue. Who could make it happen? 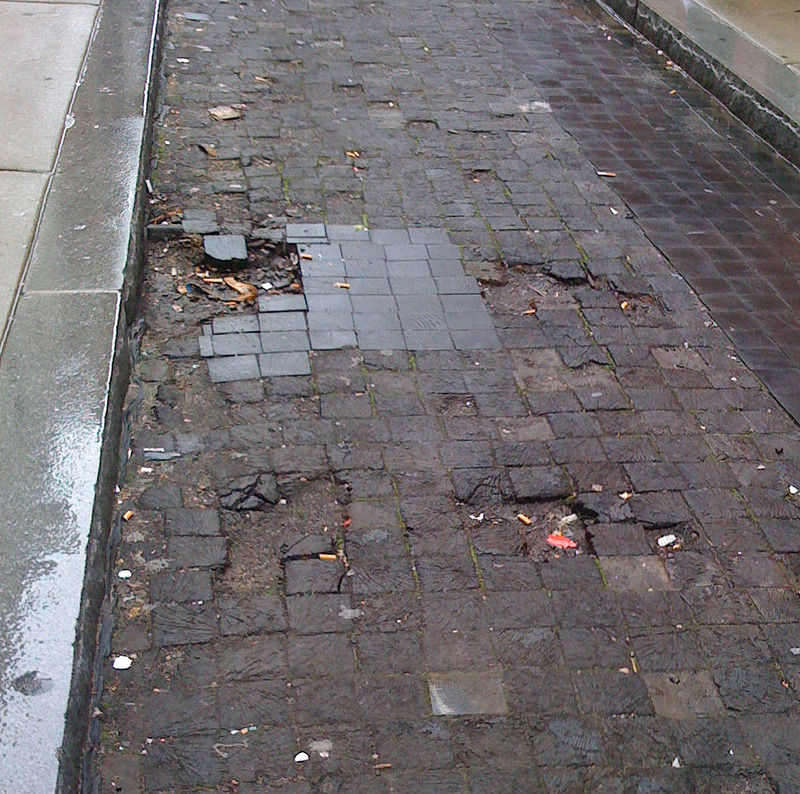 Supposedly unique in the USA, Camac Street between Walnut and Locust is paved with wooden cobblestones. Single-lane Camac street is also known as “Avenue of the Artists”. Historically it was home to many important artist clubs and organizations, such as the Philadelphia Sketch Club, started in 1860 and led by Thomas Eakins. It is surmised that the street was paved with wood instead of the traditional stones or granite belgian blocks to help mute the sounds of the horses’ hooves as traffic passed by the artist gatherings. These square blocks of wood were re-discovered in the late 1980’s during a street resurfacing project, and the city decided to repave this one section with wooden replicas of the originals. The wooden blocks are currently being replaced, which needs to happen every several years, as they begin to disintegrate and rot. 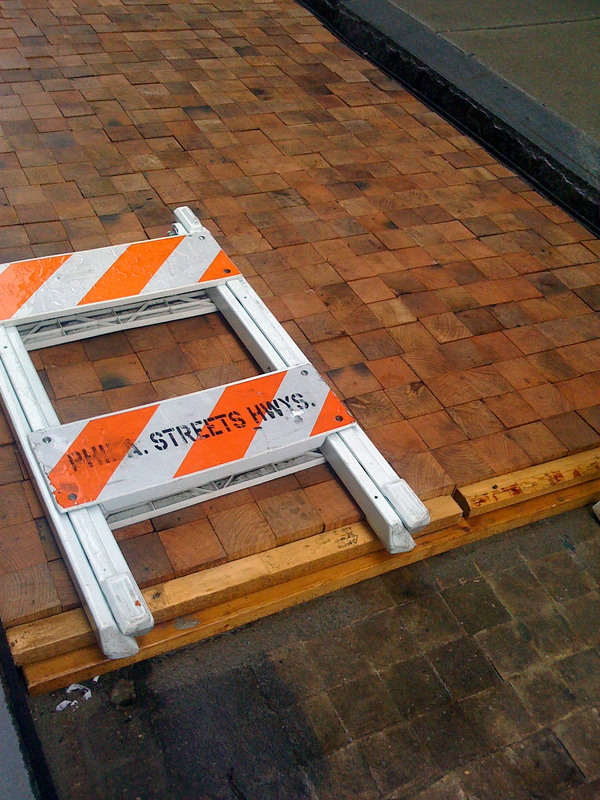 Wooden block streets are attractive, but not enitrely practical. 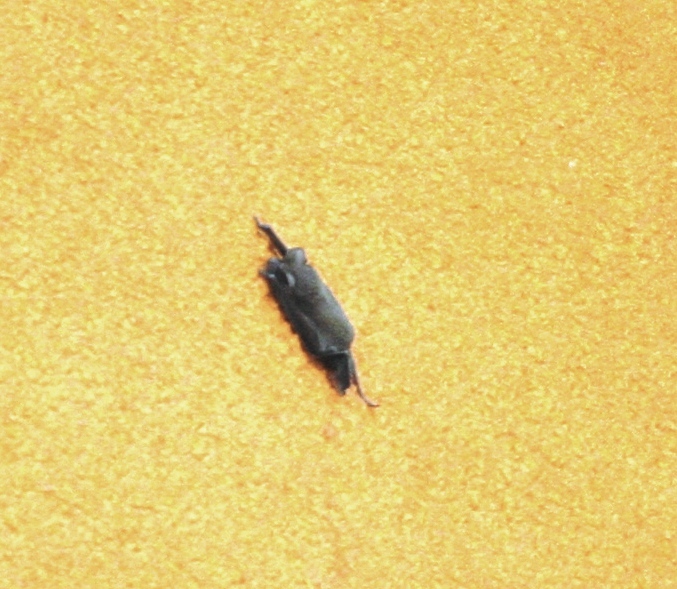 It should be pointed out, however, that asphalt also requires replacement or resurfacing relatively often. Though there don’t seem to be other preserved or refurbished streets like this in this country, wooden cobblestones can be found in historical sites around the world, from Prague to Havana. 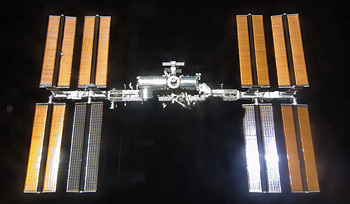 The design of the ISS evolved somewhat over the years since it was first conceptualized, but hasn’t changed too much. It’s a relatively elegant structure. I was surprised to remind myself that the Station’s construction began very recently in 1998, after the end of the Cold War allowed designs and ideas to flow more freely between Russia and the US, and also with Europe, Japan and others. 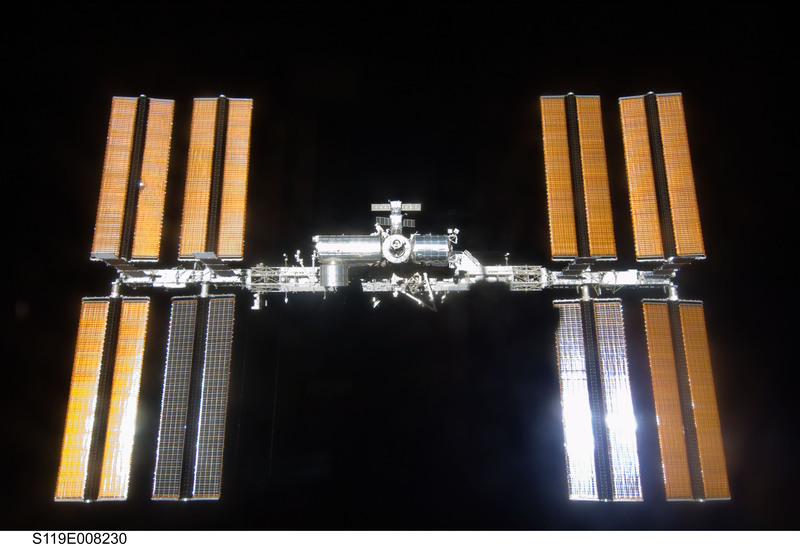 The ISS is a momentus accomplishment. Not only the impressive technology, but the coordination of design and construction thoughout so many nations all over the world. My sister, Tamar, runs a non-profit in New York City called the Women in Prison Project at the Correctional Association of NY. The CA has been around since the 1860’s, and has a mandate and a right, written into the NY State consitution, to monitor conditions in New York State prisons. Tamar’s work focuses on the women’s prisons in the state, and in addition to inspecting and monitoring the prison conditions, her group also coordinates advocacy groups, lobbying efforts and re-entry programs. Monitoring conditions in prisons, and reporting the findings, is a slippery slope. Physical visits to prisons need to be coordinated well in advance, and, like any inspection, a lot of “tidying up” will happen before the inspectors arrive. (Think cleaning up your house before a dinner party.) 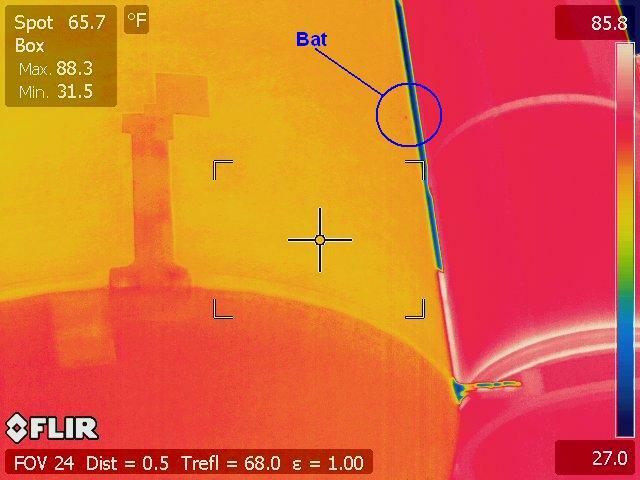 The resultant inspection will most likely find things in different state than they normally would be (Heisenberg’s uncertainty principle’s observer effect applies). So Tamar decided to also gather data on prison conditions another way — by asking questions of the inmates themselves. She enlisted me to help transform her pages upon pages of questions into something the inmates would want to pay attention to, something they might even view as fun, and not become bored with. We worked hard to create documents with enough color, whitespace, consistency and clarity to elicit a large and accurate response. We’ve created a few different surveys by now, on general prison conditions, on reproductive health issues and more, that have been sent out to all incarcerated women in New York State, and the response has been very good. I learned quite a bit about graphic design of surveys doing this, but also a lot about design in social communication — how to craft each question, in what order to ask them, how not to be leading towards a certain answer, and how to view questions as your target audience would. This can be helpful in business situations just as well. 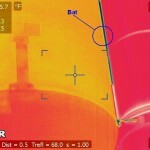 Check out one of our finished surveys here, if you wish. 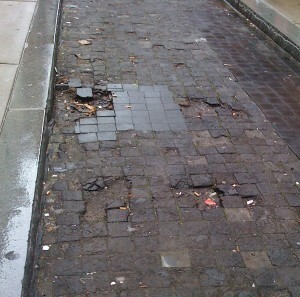 Guess a clever and cost-concious person at the Philadelphia Streets Dept. thought up this re-use of the common “No Parking — Street Work” sign. It’s cute. When budget cuts come, good design is at the top of the chopping block. Usually that is not a forward thinking solution, because an organization’s loss of credibility can be as bad as loss of credit. Though this sign looks a mess, it serves its purpose just fine, scaring off any one who would want to park here. 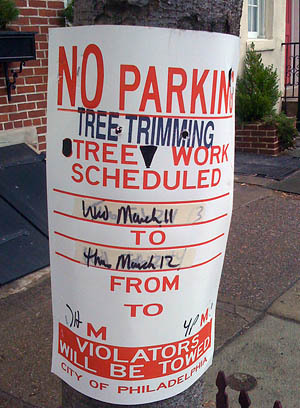 While I wouldn’t be sad to see nicely designed Tree Work signs, I think the city’s image will survive this affront.